A Batman costume can bring out the superhero in anyone. Batman has appeared in numerous incarnations throughout the years, from his comic origins to the 60s television series to the more recent cartoon series and movies. With every new program came a new costume design, offering several possibilities when creating a Batman costume. In general, the costume pieces remained the same, but there were variations in color and material each time. If you're confused by the choices, the Wikipedia entry for Batsuit includes pictures of the suit and its accessories throughout the years, or you can take your cue from the designs of manufactured costumes. Depending on the Batman you're emulating, your costume base should be grey or black. If you want a more authentic spandex-clad superhero look, a unitard or leotard and leggings would be a good choice. However, for most people a sweatshirt and sweatpants will do. The traditional Batman logo is a black bat outline on a yellow background. Other costume styles simply have a black bat outline directly on the suit. You can paint the logo right on your shirt, or create one from felt or craft foam and Velcro, glue or sew it on to the shirt. 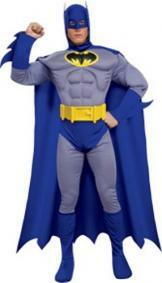 If your Batman costume has a grey base, you'll need black or blue briefs. You can use swim trunks, boxer shorts, or sew your own. If you don't want to reuse your costume pieces, you can even draw or paint the briefs directly on the grey pants. If you're using the blue-and-grey or black-and-grey color scheme, you'll need to add a yellow belt. You can search for a wide yellow belt at garage sales and thrift stores or make your own from a strip of fabric. A pre-made utility belt with several pouches is available in yellow. 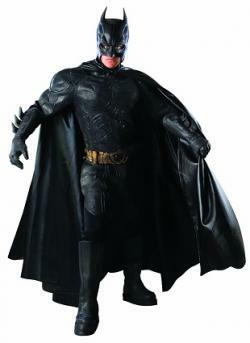 Costumes based on Batman Begins have a gold-colored utility belt while other black costumes have a black belt or no belt at all. Batman wears a combination mask and hood. You may want to experiment with stocking caps as a base, or sew a custom hood. If this look is too difficult to recreate on your own, there are several masks available, including child and adult sizes. A Batman costume wouldn't be complete without a cape to flap in the breeze. The cape is black unless you are creating a blue-and-grey costume, and then it should also be blue. You can make your own cape with a long length of fabric. The bottom edge of the cape should be cut out in a batwing scallop design. Batman capes don't seem to be available for purchase outside of full costume sets, but any cape without a hood will do. You can cut the cape to create the Batman scallop, or sacrifice a small amount of authenticity in order to use it with a witch or vampire costume in the future. Depending on the costume, Batman may wear gauntlets on his arms or full gloves. They will be the same color as the briefs, boots, You can make cuffs out of black or blue fabric or thin cardboard and wear them alone, or attach them to a plain pair of gloves. Gloves and gauntlets are also available online. 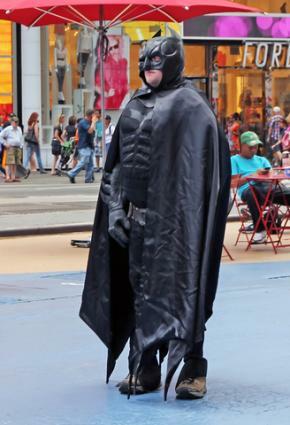 Batman wears knee-high boots, the same color as his cape and briefs. If you're wearing an all-black costume, you may choose to skip this piece since it will just blend in with your black bottoms anyway. You can transform any pair of boots or shoes by adding a long cuff to top of them. As with the briefs, you can also color or paint boot tops directly onto your grey pants. Since Batman isn't a superhero with special powers, he relies on his gear to help him get the job done. Each piece incorporates his signature bat logo in some way, from the "batarang" to the Dark Knight utility belt. Some products have been designed for costuming purposes while others can be found in the toy aisle of your local store. You can easily make your own crime-fighting tools by cutting bat shapes out of cardboard, plastic or thin foam. If you're outfitting a little Batman, this can be a fun craft for the kids. Copy ideas from the comics, cartoons, and movies or use you imagination to create all-new bat-ccessories. Batman's sidekicks and villains offer opportunities for themed couples and group costumes. If you're looking for a female costume, Batman can pair up with Batgirl, Catwoman, or Poison Ivy. Robin is Batman's traditional sidekick, and there are dozens of villains from which to choose, like Scarecrow or the Joker. Nightmare Factory has a special section of costumes for babies and kids. BuyCostumes has costumes and accessories for all ages. Even the family pet can join in the fun with the Batman Pet Costume.